Take the cranking out of your arms and into your legs for a more ergonomic method that taps into larger muscle groups, yielding amazing results at your events. Crank out up to 1.5 gallons in only 20 minutes of casual pedaling! Our new Ice Cream Bike Pro combines the wide size range and style of our steel Fender Blender Pro base frame — proven sturdy for human power use since 2006 — with a modified hand crank ice cream maker from Country Freezer — they’ve been stirring up frozen goodies since 1995. Casual pedaling effort — you can wear street clothes, even a dress and flip flops. Take the cranking out of your arms and into your legs for a more ergonomic method that taps into larger muscle groups, yielding amazing results at your events. Crank out up to 1.5 gallons in only 20 minutes of casual pedaling! Our Ice Cream Bike Pro combines the wide size range and style of our steel Fender Blender Pro base frame — proven sturdy for human power use since 2006 — with a modified hand crank ice cream maker from Country Freezer — they’ve been stirring up frozen goodies since 1995. The rust-proof gears, stainless steel canister, and a leak-proof, Amish-made White Oak tub are good for years of use. Great for events with kids, who will be fascinating with the mechanical workings and delighted with the tasty results. Kids as young as 12-14 can pedal the bike and handle the level of exertion required. Activate their minds and bodies as you combine local ingredients and their good clean Pedal Power with a positive message about energy conservation, fitness, and nutrition. The whirring and stirring noises from the machine are pleasant and won’t get in the way of teaching moments, oohs and aahs. You’ll be nourishing them with calcium, too! Kids love figuring out how the mechanical energy passes from the pedals to the ice cream tub. 1. Prepare the custard ahead of time. It must be chilled for best results. 2. On the day of your event, pour the custard into the stainless steel canister — up to 1.5 gallons! 3. Close the top using the Country Freezer’s foolproof locking pin. 4. Run the stretchy slip-proof belt from the bike’s drive wheel up and over the large white pulley on the modified Ice Cream maker. This happens in seconds once you get the hang of it. 5. Pour in the ice and rock salt. One standard ice bag per batch. 6. Pedal! The Fender Blender Pro base frame can fit riders from 4’10” to over 6′! About 15-20 minutes of casual pedaling is enough. 7. Pop the belt off, open the canister and serve instantly! Scooping the ice cream directly from the canister gives your crowd the satisfaction of seeing their labor pay off, and the motivation to make more. 8. Empty or strain the icy water, then repeat. In the photo below see how the bucket hinges to allow easy dumping. A hidden hinge allows you to easily dump the icy ‘brine’. You can strain and reuse the ice for the next batch. Encourage creativity! Have your event attendees craft the next flavor by combining their favorite swirl-in ingredients like berries, cookie crumbles, or coffee into the base custard. Just as food tastes better in the great outdoors, Pedal Power can turn your latest concoctions into true delicacies. 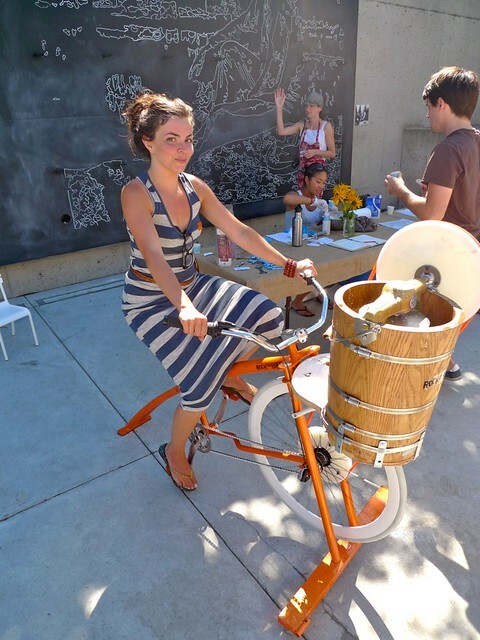 An Ice Cream Bike Pro is a hit at events year-round, indoors or out. 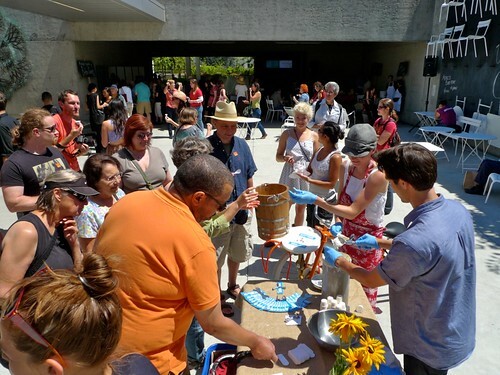 Fairs, concerts, conventions, gala dinners, trade shows, food cart gatherings, and summer camps — any crowded event is an opportunity to spin up a Sundae. You can even combine an Ice Cream Bike Pro with a bike blender for amazing milkshakes. Satisfy the specialty dietary needs of your audience, with low-fat alternatives like frozen yogurt, or dairy-free recipes such as sorbet. Team up with a local dairy, egg, or berry farm and you might find a low-cost or sponsored source of ingredients while and an opportunity to co-promote their foods. – Makes up to 1.5 gallons (6 quarts) of ice cream per batch. Works great on small batches too. – Takes only 15-20 minutes of pedaling per batch — compare to 20-30+ minutes for hand crank! 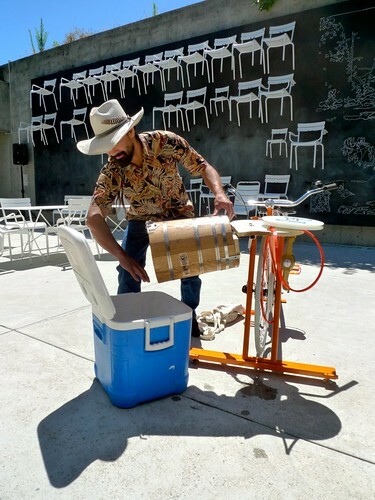 – The action happens in the front, making ice cream churning more fun and social: pedalers can see the canister turn, the icy brine swirling and transferring it’s deep-freeze temperatures to the custard. – Frame works for adults and teens — custom version available for smaller kids. – Comes with most tools needed to assemble and detailed instructions, as well as video instruction on set up and clean up of the Ice Cream Bike Pro. – Many good surfaces available for your organization or company’s name: the front wheel and large diameter frame tubing are great surfaces for branding which will show up in many photos from your events. We’re experts on custom-branding our bikes and can assist you with our branding options. – Available in Blue, Orange, Green, Red or your custom color. Above: A branded Ice Cream Bike Pro — VCU opted for custom color and wheel branding on their model. Weight: Ships in two boxes, which total to 90 lbs. 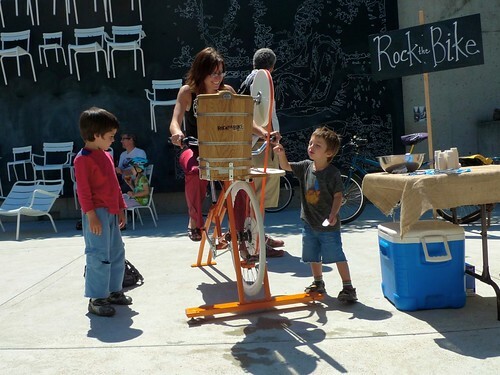 Above: Kids crowd around the Ice Cream Bike Pro as it churns up goodies at Stomp! 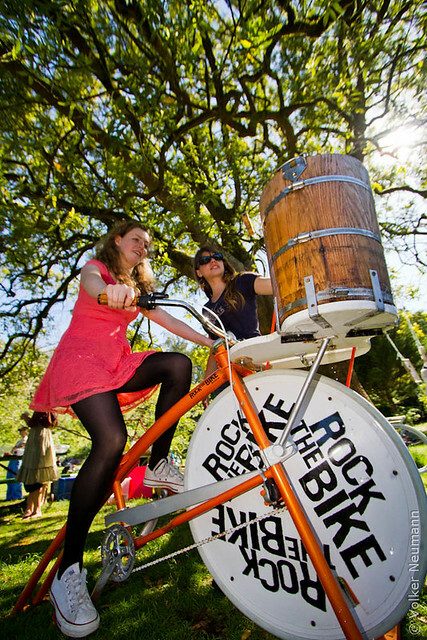 “Rock the Bike’s Ice Cream Bike Pro helped make our event special! The bike was hands-on, great to look at and learn about, and then, delicious to enjoy. 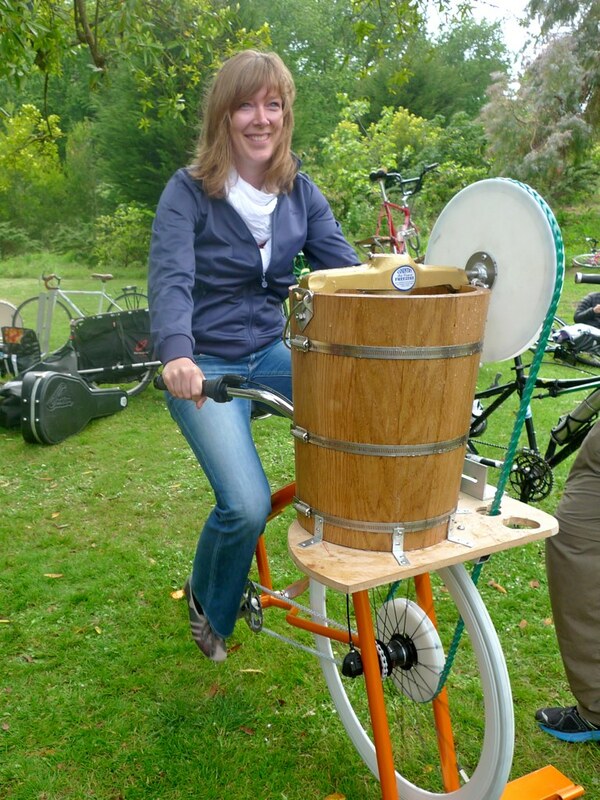 A happy pedaler churns the custard into Ice Cream Pro at the 2011 SF Bicycle Music Festival. The ice cream sold out, raising funds for the event. Last but not least, did you know we have an Ice Cream attachment for your Fender Blender Pro?! It’s called the Icycleta Ice Cream Attachment and it’s amazing! 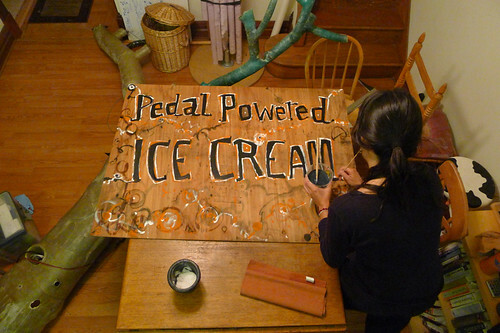 You can now add ice cream churning to your list of Pedal Powered activities on the Pro frame you already own. What Style Wheel Do I Have? What kind of vehicle should I use to transport the Pro frame? Above: A pint or two of Coconut Almond Sorbet at the right consistency. Sorbet is a delicious vegan treat with lower fat than traditional ice cream. Below you will find a no-cook recipe to make 1 gallon of Toasted Almond Sorbet. Depending on your serving sizes, you can serve anywhere between 128 1 oz. servings and 32 4 oz. servings. The combined cost is roughly $40. If you sell 4 oz. servings at $4 each you could profit $88! If you use a cheaper nut than toasted almond, then you can cut your costs in half and increase profit to $100! A large spoon for mixing, serving bowls, ice, salt, and an ice cream scoop. Stir all ingredients together and pour into your pre-frosted canister (or pour into the canister and stir if you’re at an event). Secure the canister into the oak tub, and surround with ice and salt. Attach the slip-proof belt and begin to pedal your Ice Cream Bike Pro or Icycleta Ice Cream Attachment for roughly 20 minutes until solidified. Serve immediately, or pack and store to make more firm. If you have a recipe you’d like to share with the bike blending community, please send it to customerservice@rockthebike. 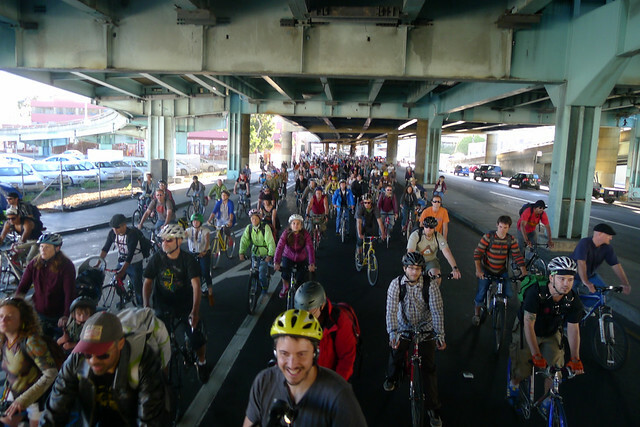 Many thanks San Francisco Bicycle Music Festival: World's largest Human Powered Music Fest. The 6th Annual San Francisco Bicycle Music Festival was our biggest ever and a milestone for our grassroots Human Powered Music Fest. Many thanks to the bands, fans, and our huge volunteer crew. Any one of the 3 phases of the day would have been epic enough. But we had a beautiful, idyllic daytime music festival in the park, an outrageous mobile party, and a post-modern urban block party all in one day. Daytime: 500+ people in a meadow, enjoying live music in the beautiful sunshine… Followed by a fire-truck dodging, freeway underpass screaming, Fossil Fooling LiveOnBike session, with captain Ariel using no electric assist to pull 3 performers and audio gear weighing 250 pounds on our Mobile Stage… Followed by a street party with an elevated stage, a glowing Bike Tree, and a 3-person pedal powered stage lighting system. Rupa & The April Fishes perform at Golden Gate Park’s Log Cabin Meadow. Photo: Volker Neumann. 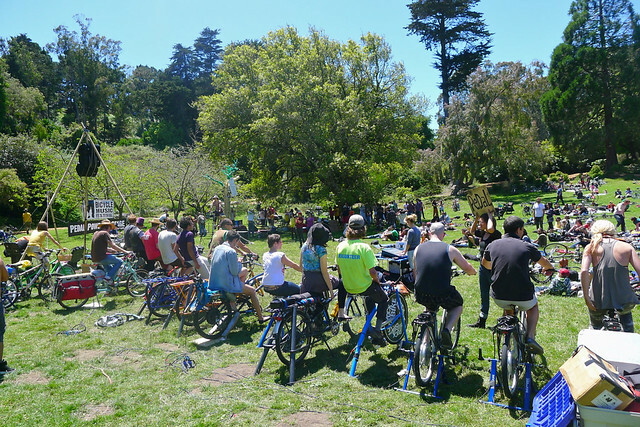 We had 19 pedalers at the peak in Golden Gate Park! Plenty of power for our 10000-Watt sound system to run. In the distance you can see our Pedal Powered Line Array hanging from its bamboo tripod. We mobilized the entire festival on an outrageous LiveOnBike ride with yours truly, Fossil Fool, the Bike Rapper, performing with two bandmates on an elevated Mobile Stage towed by a Mundo. Above: the view from the Mobile Stage.